Susie Bannion (Dakota Johnson) is a young dancer from America and has made her way to a famous dance academy in Berlin. There she makes an impression upon one of the heads of the academy, Madame Blanc (Tilda Swinton). Unbeknownst to Susie, the school is actually a front for a coven of witches who are building towards a ceremony that will reincarnate Mother Helena Markos (also Swinton), one of The Three Mothers (consisting of the Mother of Sighs, the Mother of Darkness, and the Mother of Tears). In the same city, aged psychiatrist Dr. Josef Klemperer (also Swinton) learns of the school and its activities from a former student and takes an interest. To quote a famous film and its meme-inspired follow-up, one does not simply watch and form an opinion about 2018’s Suspiria. It’s a complicated film, one that’s a polar opposite of its predecessor in terms of narrative, performance, music, and style. Practically everything about it is different outside of its basic story, which was a mere kernel in the original film. It’s a new vision, one that not only takes a step in a different direction, but expands upon the material and makes it totally fresh and relevant to anybody, whether they’ve seen the original film or not. My personal opinion of it is immediately positive. It’s poles apart from the original film and I can, for the most part, happily forget and enjoy it on its own terms. The performances from Dakota Johnson and Tilda Swinton, the latter of whom portrays three different characters, are definite stand-outs. In fact, had they co-shared an Oscar win for Best Actress, I would have been in complete agreement. Swinton, in particular, shows a rainbow of emotions in her three performances, revealing an enormous amount of pathos, particularly from one of her characters towards the end – a scene that, to my amazement, had me in tears. Thom Yorke’s melancholy score and songs, including the memorable opening number, as well as the dry and dark cinematography of Sayombhu Mukdeeprom, are significant highlights as well. The dance sequences, the way they’re choreographed, shot, and edited, are also show-stoppers. Dakota Johnson’s audition at the beginning is certainly spellbinding and lets you know right away that this is a film all about dancing. Even the costumes that the dancers wear for the film’s major dance sequence towards the end are unique. All of them are practically naked, and their work is an explosion of bare skin and obsessive technique. Suspiria 2018’s major flaws are its overt ties to the original film, mainly story beats that are used verbatim, such as a character counting her steps as she explores the school in order to find a hidden door. It’s not a flaw in the strictest definition of the word, but those moments took me out of the film and reminded me that I was watching a remake. Further illustrating this differentiation, a sequence in which a character is contorted violently through the use of black magic is disturbingly brutal, but is also bloodless in comparison to the opening moments of the 1977 film. I don’t want to come off like somebody who believes this to be a misunderstood masterpiece. After all, upon its release, it received a polarizing response from audiences and critics who either didn’t know what to make of it or just hated it altogether. It’s entirely understandable. It isn’t a comfortable film at all, but more of an art film with a storyline bent. Some might call it pretentious while others may call it unnecessary, but what you cannot accuse it of being is boring. In essence, 2018’s Suspiria is a total sensory experience, but also goes through a range of emotions – from dread to horror to sadness, in a way that I was certainly not expecting. It’s fascinating, actually, and requires additional viewings in order to sort it out even more. One might not understand everything about it the first time through, but it’s worth the time to do so. It’s certainly one of my the best remakes of recent memory, which I know is opening a can of worms for some readers, but I can’t deny how entranced I was by it, or how fulfilled I felt upon its conclusion. Outside of comparing it to films by David Cronenberg and David Lynch, there really is nothing else like it. 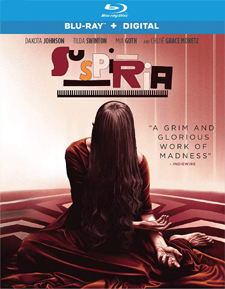 Suspiria 2018 comes to Blu-ray from Lionsgate. Shot on 35mm film with a 1.85:1 aspect ratio, which has been replicated here, it’s a sumptuous presentation, one that certainly makes use of the darkness by not revealing all of the details all of the time, which is far more effective for a horror film. Grain levels are solid throughout and detail is abundantly high, whether it’s the interiors of the school or the snow-covered streets of Berlin. The color palette is somewhat drab at times by design, but explodes with bold reds when the opportunities arise. Black levels are deep and everything appears bright enough without ever losing track of characters or the spaces they're in. It’s also a stable and problem-free presentation, free from any digital enhancements. 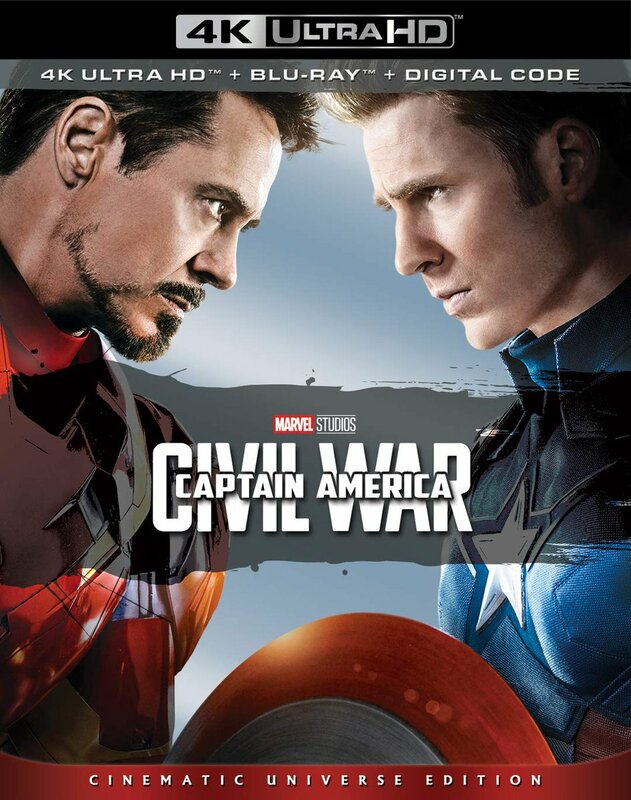 The audio is presented in English Dolby Atmos, with an optional English 2.0 Descriptive Audio, as well as subtitle options in English SDH and Spanish. This is certainly a film that takes advantage of its sound design. Fidelity is superb throughout, particularly in situations where there are a number of characters speaking, meaning that voices can be heard all around us. Dialogue is clear and precise, as is Thom Yorke’s music and the sometimes subtle use of sound effects. The use of LFE is never that potent, but the soundtrack is otherwise aggressive and immersive in all the right ways. On the other hand, the extras selection is certainly disappointing. What you get are three featurettes that are 4 to 5 minutes a piece: The Making of Suspiria, The Secret Language of Dance, and The Transformations of Suspiria. All of it is fairly straightforward EPK material that doesn’t really get into the nuts and bolts of the production. Also included is More from Amazon Studios, which contains trailers for You Were Never Really Here, Beautiful Boy, and Cold War, all of which also open the disc. The 2018 remake of Suspiria is one that I haven’t quite shaken yet. I found it stunning in many ways and emotionally effective in others. It’s not a film for everyone, and I can definitely see accusations of unevenness being lobbed at it, but it all worked fairly smoothly for me personally. Lionsgate’s Blu-ray release features a top notch high definition presentation, but hopefully a state-side 4K-UHD upgrade with more extensive extras is somewhere in the offing.